Ah the smell of freshly baked bread, the sign of a well organised, domesticated home. Nope. Not in this house – it’s the sign that I’ve not had chance to go to the shops and we’ve got people staying over. Still, if that’s what it takes to get me making fresh bread then that’s fine by me. I did admit this to the people staying over, so I promise I wasn’t trying to pretend I’m a domestic goddess when actually I’m more of a domestic mess. I didn’t want to make a fully wholemeal loaf as they always turn out like a brick (my bread skills aren’t that good yet) so this is a half and half loaf. I also added some honey to give it a more interesting flavour. I knew that the sugar would activate the yeast faster, but I wasn’t quite prepared for the bald-headed bloomer that emerged from the oven. Ihad to resist the urged to draw a face on it. The texture of the loaf was quite tight, but that meant it made for a good toasting and sandwich loaf. Keeping the yeast and salt on opposite sides, put the flour, salt, oil and yeast in a large bowl. Stir together. Dissolve the honey in the lukewarm water and stir into the dry mixture. You should have a soft dough. You may need more water – it will depend on the weather and your flour. I used about 475ml in the end. Knead or use a dough hook to knead it for you until it is smooth and silky looking. Roughly 5mins by machine or 10mins by hand. 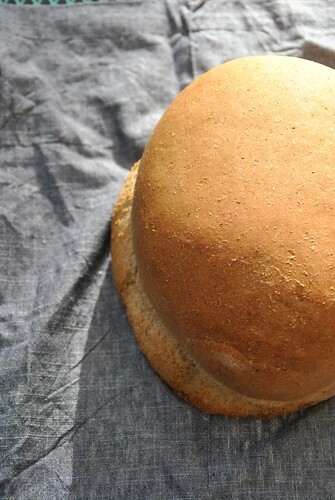 Shape into your desired loaf shape and place on a greased tray. Cover with a greased bag or a damp teatowel (but not touching the dough) and leave to rise until doubled in size. Preheat your oven to 230C/450F/Gas Mark 8. Uncover and bake for 30-35 mins until golden brown and it sounds hollow when you tap the underneath. 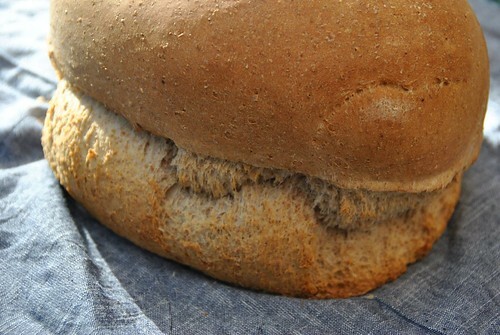 You could slash the top of the loaf before baking to make it look more interesting and let it spread more. If you want a crunchy crust put a tray of water in the bottom of the oven for the last 10mins. If you want a soft crust, wrap in a moist teatowel when you take it out of the oven.